Before the beginning of the event we will pick you up at your hotel in time and take you with a luxury sedan directly to the gates of the festival center. At the end of the festival, we are obviously back with the same limousine. 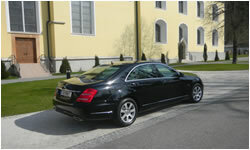 The chauffeur will accompane you to the vehicle and will bring you to your next destination (hotel, dinner ...). While you enjoy your dinner your limousine is waiting for you and your guests. So you feel free in your time- management and enjoy the evening. If you are too busy to plan your Salzburg Festival holiday, we can take the stress out of you. We will organize your hotel room, your sightseeing tours, your dinners after your instructions. Give us a plan and you will be satisfied with our organisation. Please feel free contacting us.